When seniors adopt pets, measures must be put into place for the care of the pets when your aging loved ones can no longer properly take care of them. That is a conversation that needs to be held up front, before the pet comes into the home. You also need to determine what type of pet is best for your parents. Cats require less care than a dog, but a dog will help assure your parents are up and mobile. Taking the dog for a walk is an ideal way to stay agile and even involved in the community and that can stave off loneliness. 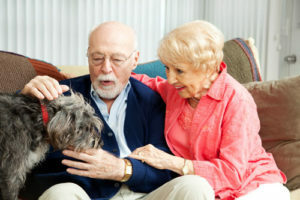 What are some other ways in which the seniors in your life can benefit from animal companionship? Physical activity. As mentioned, owning a pet means they will be involved in regular physical activity. Cats need to be played with. Even fish and reptiles will require some level of interaction and activity. Dogs need to be walked and you might want to consider a medical alert system to provide added peace of mind when on the go. Companionship benefits. Having a pet in the house will mean your loved one will never be alone. If you don't live close by, it is important that they have a companion as depression can set in when loneliness sets in. The loss of a spouse and a dwindling circle of friends can lead to isolation and that can, in turn, lead to a whole host of health issues. Physical health benefits. It's been shown that the mere act of petting an animal can help lower blood pressure. It's also been shown that caring for a pet can not only lower your blood pressure, but improve cholesterol levels and provide better heart health. Weight loss. While having a pet may not lead to weight loss, it may help with weight control, especially if they have a dog. Dogs require physical activity and regular walks and that means your loved one will be physically active as well. Physical connection. If your loved ones live alone they may be bereft of the physical connection of a hug or other human touch. Being able to wrap their arms around their pet can help alleviate that physical craving for human touch. The positive impact that pets have on our lives cannot be denied, but they do need to be adopted with care with provisions made for their care when your aging loved ones can no longer take on the responsibility.